for us. The two of us essentially switched places, giving us a common ground on two different planes. 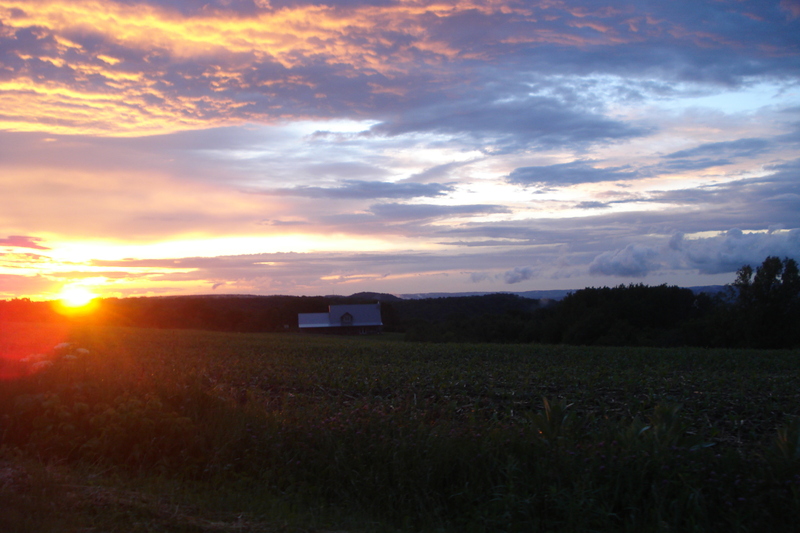 Kate now lives in the busy city of Pittsburgh, Pennsylvania and I am living in the scenic countryside of Wisconsin. Besides the occasional bout of homesickness, I am enjoying this new life of mine. As I transition into a country girl I have gotten to experience lots of new things. Thus far, I have assisted in roofing a house, I have weeded cilantro with my beautiful new sisters, I have begun to crave organic produce such as asparagus, I helped with a community barn demolition project, I have taken up tennis, I have assumed the duties of Ascension Builders LLC’s secretary and I am learning to cook! Sometimes I find myself dumbfounded by the ridge and the fact that I now call it home but I am on an extended adventure. I love my husband and he feels like “home;” my surroundings are slowly beginning to feel like” home” too. Did you miss the Sweet Ridge story of Rob and Nicole’s gorgeous Red Dirt Wedding and Wisconsin Barn Dance? Here is is, in detail, with lots of pictures! This entry was posted in Nicole on June 23, 2011 by sweetridgesisters. Hey Nicole – I hope you continue to like it! I love the “Ascension Builders” name – they come up with the best names. Hi Nicole! I’m so glad you’re joining the blogging sisters! I’m glad the adjustment is going well for you–what a change. And I also love how you say your husband is home–that’s how I feel about my husband Adam as we’ve moved from Bloomington, Indiana to Newark, Delaware and now are in the bustling city of Chicago. Through all these changes I’ve never stopped feeling I’m home, and it’s because of him. I know this comment is late, but I am new to your blog. I am thoroughly enjoying the different perspectives that come from each of you and love hearing about the adventures of the sisters! It is always great to get comments, and I’m so glad you are enjoying all the perspectives. This is Kate- I want Nicole to write more soon, so I will make sure she sees this!